You can access results page when you go to “Events” page in Loquiz PRO, in the events list behind each event, there is a web link. Or you can open the game in a device in test mode and choose “Results” from the game’s menu. On the online results link you will find several subpages (see screenshot below). There are maximum 7 subpages – Game info, Answers, Results, Map, Progress, Photos, Chat (see screenshot below). The amount of subpages depends on the game type and on the choice event creator has made. NB! When logged in to the Loquiz PRO webpage all the results subpages are visible, the wider public sees only results subpages that event creator has marked as visible. To change the visibilty of results subpages, open event for editing, go to “Results” tab and mark all the subpages you want to be visible for the public. Game info subpage is meant for the instructor and lists main game attributes like game’s time limit, number of tasks, intro text etc. It is good idea to share this link with the instructor. On this page there are links to all other available results pages for this game type. This screen is available for all game types. On this subpage, there are all tasks used in the game with answers. This is not meant to be shared with players. During the game you will also be able to see how each team answered each task. It is powerful tool for instructor to pick up the most interesting tasks after the game. This screen is available for all game types. Progress subpage shows the teams progress through the game in a simple way. Teams progress is shown on a timeline, there you can see what tasks each team answered (numbers), when did they answer and if the answer was correct (green colour) or incorrect (red colour). This is a good page to be shown when presenting results to the players on a big screen for any game type. This screen is available for all the game types. NB! If you see zeros in the progress, then you have removed a task from the game! Results table shows results of all the teams in one handy table. You can see a team name, score, amount of tasks answered, distance and playing time. Use this table as a tool to wrap things up and to announce the winner. It is possible to filter the table by the headings (score, answers, etc.). Results table is available for all game types in slightly different forms. On this subpage, the map of the game and all the tasks’ locations are shown. During the game teams’ locations and route will also be shown on a map. Team status is updated in checkpoints. When game ends, you will see paths that team chose to navigate through the game from point to point. Map is a great tool to check where teams are and also to analyze the game. Map subpage is available for Clue, Rogain, Strategy, Scavenger and Match game types. This subpage is shown only if your game includes photo and/or video tasks, all the photos and video made during the game will be uploaded here. Please note that photos and videos are uploaded to the server only if there is mobile data connection after taking the photo. If the mobile connection is not present, media is saved only in the mobile device, but not sent to the server. When the game is over this notification appears “Your results are not fully uploaded! Please notify the instructor.” If the device is returned to the internet connection area and the application is still running then videos and photos will be updated and the notification will disappear. Delete photos (logged in users only). 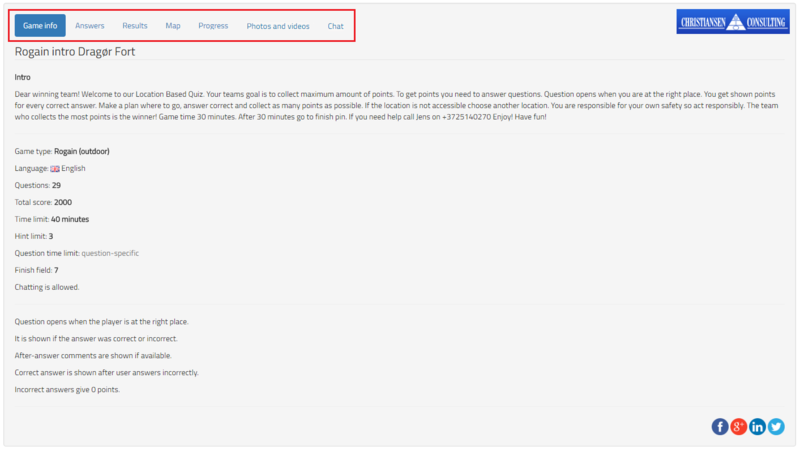 Add bonus points to the photos and videos (logged in users only) to award specific team(s). Bonus points will be added to the team(s) score that they got for making the photo/video. Bonus points are added to the total score. There is no limit on how big or small (negative) the bonus points can be. Bonus points can be changed at any time. Keep in mind that the added bonus points do not affect scavenger score activation and teams will not receive a notification message about the bonus. Bonus points are added to the total score, but teams can only get live feedback from “Show scores of other teams during the game.” Shown in the app main menu. Which has to be turned on in game settings (configure) page. Filter photos based on team name and/or task name. Show photos and videos as a slideshow (just click on the photo/video to open this view). Download entire event photoset for local viewing (please note that if there are a lot of photos, this might produce a very large file that exceeds the server limits). NB! Download button (“Download media”) is only visible when user is logged in to Loquiz, this button is not visible if results link is shared with the client. This subpage is shown only if chat is used in the game. On this page you will find all chat messages sent during the game (also private messages). From this page user logged into PRO can chat with teams during the game. The game instructor can send messages to all teams and also private messages to the teams one by one. The instructor can also delete messages. There are several ways on how to share the results link with instructors, spectators and players. You will find event-specific web link on “Events” screen in Loquiz PRO. Link stays active after the game has ended even if the event is closed. You should send “Game info” link to the game’s instructor and “Results” table link to players or spectators. Results links can be included in welcome/info text, then players can open it during a game in a built-in browser. So if you want to make the results available during the game for all players, paste the link into the welcome text box. If you want players to easily access the results after the game ends, add the results link to the finish message. This link will open outside the app, in the device’s default browser. Make sure you close your event after the game, so nobody can start the game again. Go to pro.loquiz.com → events to close (deactivate) the event.